I want to win stuff! What is wrong with everyone, where are the hordes of entries!??? As part of their Happy New School Year program, Nestle Family is sponsoring the Ready, Set, School! Sweepstakes. The grand prize is $5,000 for back-to-school essentials and a $2,000 literacy grant for your favorite school and it's up for grabs until the end of the month. Plus, every day someone will win a Five Star Messenger bag filled with school supplies from Mead. Enter daily to improve your chances! 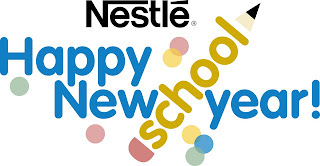 Nestle Family would also like to offer one lucky reader a Happy New School Year Resolution "Start the Day with a Healthy Breakfast" prize package featuring free coupons for: Boost Kid Essentials; Carnation Instant Breakfast Essentials and Ovaltine as well as recipe cards for Tropical Sunrise Smoothies; Creamy Chocolate Smoothies; Pink Razzy; and Blue Monkey Smoothies. To enter and win this prize (worth approximately $40), please comment on this post with your schoolyear resolutions. Entries will be accepted through September 22nd and I'll pick the winner using Random.org. US readers are eligible. My resolution for this year is to feed my kids more than just cereal for breakfast. I am making a 'hot' protein every morning. They are liking it. My resolutions for this year is to make sure all clothes are ready the night before,make sure the kids have a good breakfast every morning and finally to wake up when the alarm goes off without hitting the snooze button a hundred times. Thank you! My resolution is to help the kids with homework. My schoolyear resolution is to keep up with when library books are due. I always lose track once we get snow days and such. My resolution for this school year is to do educational activities with my little ones every day! My resolution, to be on time, and to feed a healthy breakfast to my kids before school. My resolution is to pack as much stuff for her lunch the night before school...with the exception of her sandwhich. But if I can have her fruit and whatever else all packed, that will save me such a headache!